Fig. 259 Puparium of Cerodontha incisa (x20). 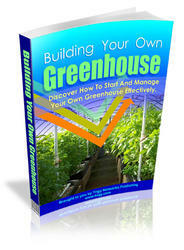 various other protected crops, including cucumber, lettuce and certain ornamentals. Infestations on seedlings and young plants check growth and will weaken or kill them; mines in the cotyledons are particularly damaging. Larvae within cotyledons may also burrow into the growing points or terminal shoots and frequently cause the death of plants. Attacks on established plants are less significant, although hosts may be weakened if outbreaks are severe. Adult feeding punctures on leaves (see below) are disfiguring. In Europe, this pest occurs mainly in the Channel Islands, Denmark, southern England, France, Germany and the Netherlands. At first, adult females feed on exudates from the foliage, having first formed prominent punctures in the leaf surface with their ovipositors. Later, eggs are deposited in the upper surface of the leaves. These hatch in 4-8 days. Larvae then burrow beneath the upper epidermis to form long, irregular, whitish mines. Each mine contains a narrow trail of frass that may change from one side of the gallery to the other. 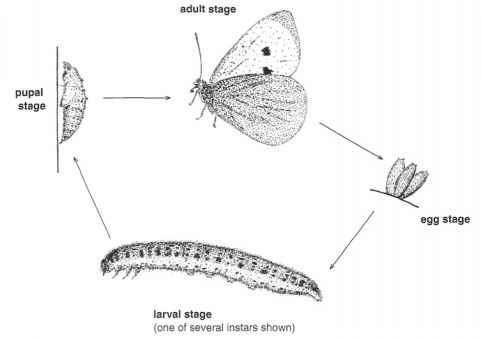 The larvae are fully fed in approximately 7-12 days; they then vacate their mines, usually cutting their way out through the upper epidermis, and fall to the ground. They then enter the soil to pupate. Adults appear 2-3 weeks later, although emergence will be greatly delayed by cool conditions. There are normally three or four generations annually; puparia overwinter in the soil. Adult mainly pale yellow; head, thorax and abdomen partly shiny black dorsally; scutellum bright yellow; antennae mainly yellow; legs blackish with yellow femora; wings 1.8-2.1 mm long, the costal vein extending to vein M1+2 (see Fig. 260a). Egg 0.25 x 0.15 mm, white. Larva up to 3 mm long, yellowish-white; mouth-hooks with several prominent teeth; posterior spiracles mushroom-like, each with an arc of 7-12 pores. Puparium 2mm long, brownish-yellow. Fig. 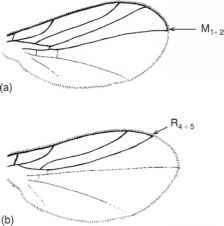 260 Wing venation: (a) Liriomyza; (b) Phytomyza.